Tuesday, March 24 1908 -- The big day is finally here. Battling Johnson and Fireman Jim Flynn will meet in the squared circle this evening for their 10-round battle. On the weazel-skin hat front, former boxing champ Jim Jeffries is announced as the twelfth attendee at Gooseberry Sprig's soiree and inquisition. 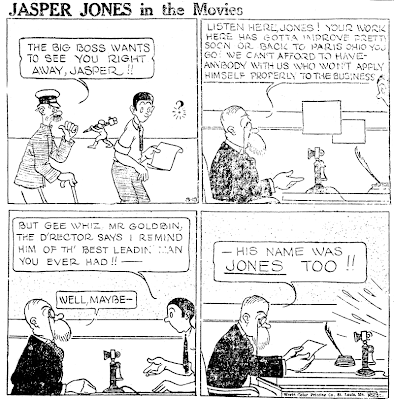 Who was Barney, the artist of Adam Zapple (later as Jasper Jones) in the Movies? I haven’t found any information on him but I believe I know who was responsible for distributing the cartoon. His name is William Ralph Horton Jr., an artist and newspaperman. The 1880 U.S. Federal Census has his birth in December 1879 and the first child of William, an artist, and Mary; the census enumeration date was June 9, 1880. His World War I draft card said he was born December 10, 1880, which was the wrong year. …He joined the Plain Dealer as an artist in 1908. By 1913 he was head of the art department. He resigned in 1929 [sic] to enter the advertising business. Before joining the Detroit News in 1933 he worked for the Columbus Dispatch, the Cincinnati Enquirer, the New York Herald Tribune and the Curtis Publishing Co., Philadelphia…. …Ralph Horton and T.C. Hoffmeyer, well known Plain Dealer men enter the “ex-P.D.” class to take a chance at the game of business. Ralph Horton, fifteen years with The Plain Dealer, part of the time in the advertising department, afterwards director of the art department and later in the advertising promotion department, is the head of Horton Studios Co., Inc., a concern that will devote itself to practical art for lines of advertising…. The Department Reports of the State of Ohio, from October 16, 1919 to April 8, 1920, listed the new company: “The Horton Studios Co., Cleveland, $11,000. 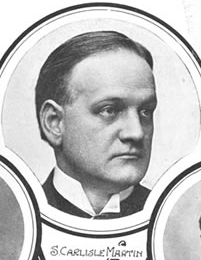 W.R. Horton, T.C. Hoffmeyer, R. Tomaso, M.B. Vilas, C.D. Simmons.” The Fourth Estate, February 21, 1920, reported that Horton and Hoffmeyer were partners in the Hoffmeyer-Rutledge Company, an advertising agency. Horton was knowledgable and experienced in the inter-relationships of advertising agencies, newspaper advertising and comics, and now he had an agency and studio to execute his business plan. The 1922 Cleveland Directory had a listing for Horton Studios Inc., with Horton as president and treasurer, and Vilas as secretary. The business was located at 2077 E 4th. 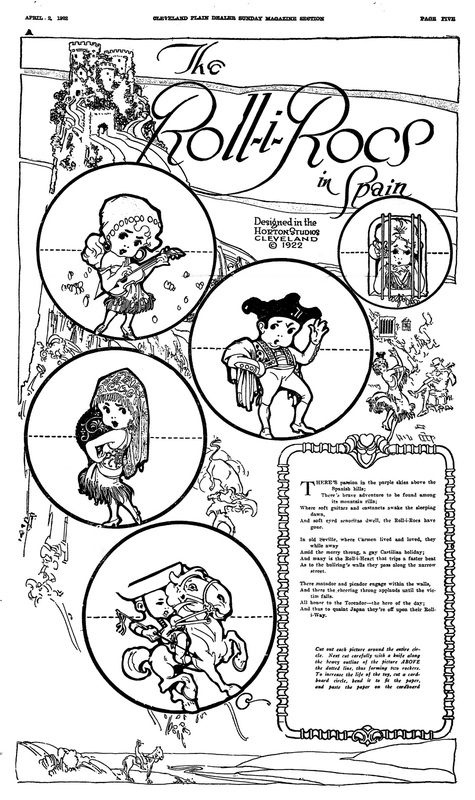 One of the studio’s newspaper features was Rolli-i-Rocs, a full-page children’s cut-out activity. 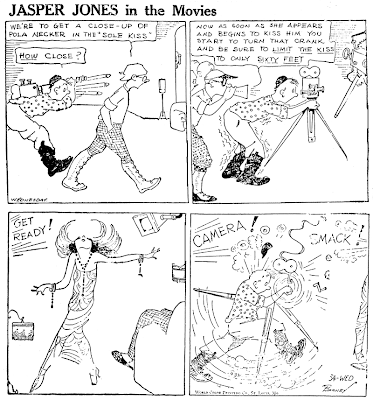 It debuted in the Plain Dealer December 25, 1921. The Bookseller and Stationer, February 13, 1922, named seven of the several newspapers which carried Roll-i-Rocs: Pittsburg Gazette-Times, Springfield Union, Fort Worth Record, Atlanta Constitution, Hartford Courant, and Detroit Free Press. I believe Horton Studios (not Morton or Norton, as Allan guessed based on blurry bits of syndicate stamps) produced Adam Zapple in the Movies, which began, according to the earliest copyright date, around 1922. It was part of World Color Printing’s Fun in Black and White page. If you look closely at the bottom of the middle panel of Adam Zapple (below), the copyright line says “Horton Studios”; this line did not appear on every cartoon. My guess is that cartoonist Barney was a Cleveland resident. Notice to Creditors of The Horton Studios Company. All persons holding claims of whatever nature or description against The Horton Studios Company will take notice that they must present the same for alliance to W.R. Montgomery, 806 Fidelity Mortgage Building, Receiver of The Horton Studios Company, in Cuyahoga County Common Pleas Court, Case No. 220775, before May 1, 1924, or they will be forever barred from participation in the distribution of the funds in said Receiver’s hands. By virtue of court order of April 5th, 1924, in said action. By Simmons, DeWitt & Vilas, and A.S. Brier, His Attorneys. How World Color acquired the cartoon from Horton is not known. 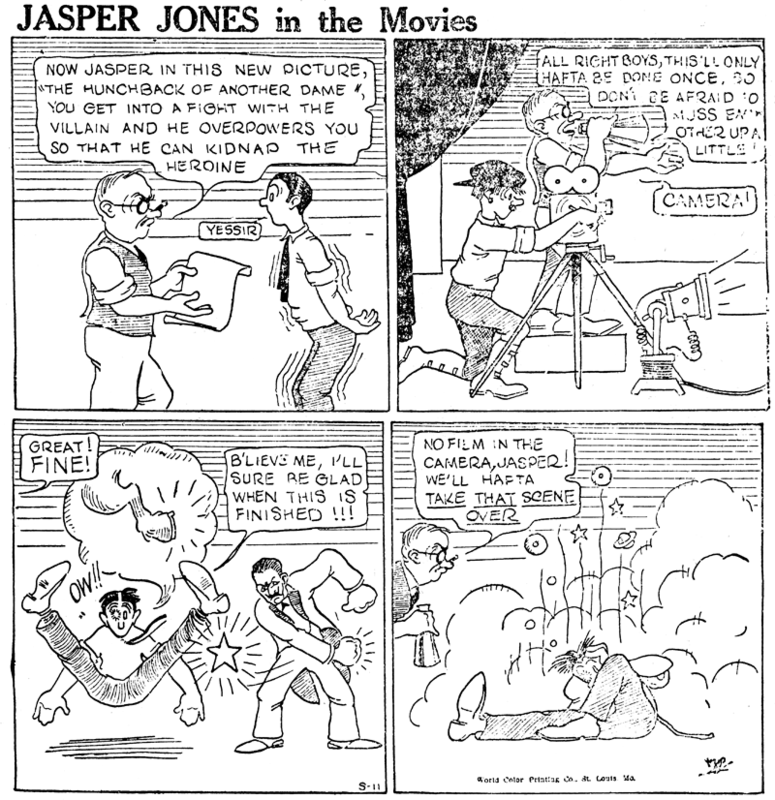 Some time later Adam Zapple became Jasper Jones, with a World Color Printing copyright; perhaps the copyright for Adam Zapple was contested, so the name was changed. 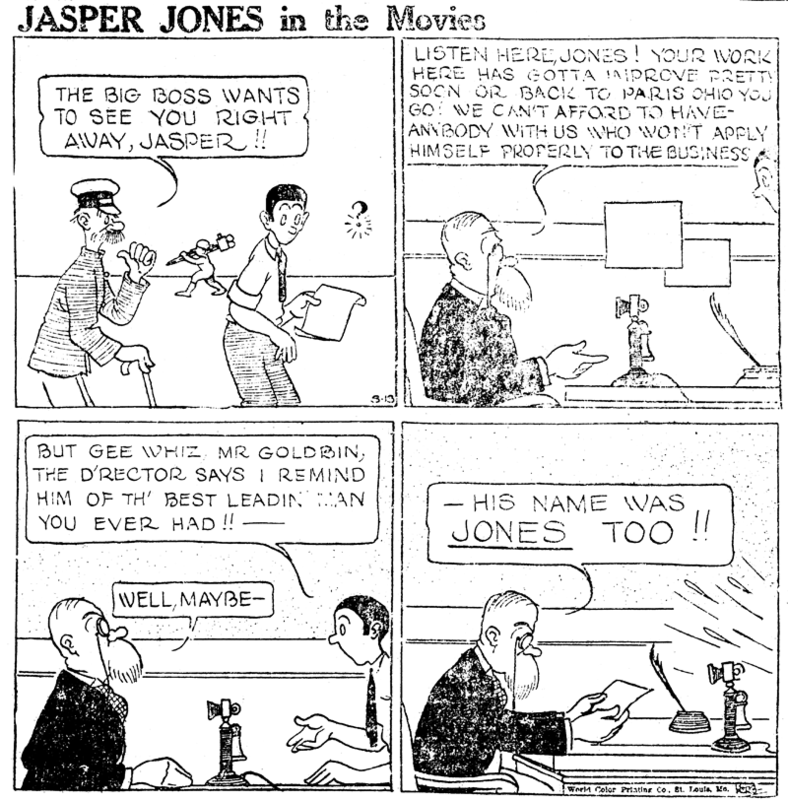 The exact number of features and cartoons Horton Studios produced is not known at this time. *My apologies to Dr. Seuss. In the 1920s, World Color Printing was having a heck of a time holding onto clients for their pre-print Sunday comics section. The section itself was rather pathetic, filled mostly with reprinted material, and the economics of pre-print sections were less attractive than back in the 1900s. Looking for other products with which to tempt newspapers, World Color came up with the idea of weekly pages of amusements for kids. The pages would have stories, games, puzzles and comics. The idea actually went over rather well, both with daily newspapers who would use it in their Saturday or Sunday issues, and weekly papers, which saw it as sort of a one-stop shop for a feature page. World Color had at least two versions -- one heavy on comics, another heavy on stories and activities. I can't vouch for the other features on the weekly pages, but the comic strips were all reprints, some so old that they must have looked quite ridiculously out of date to readers. 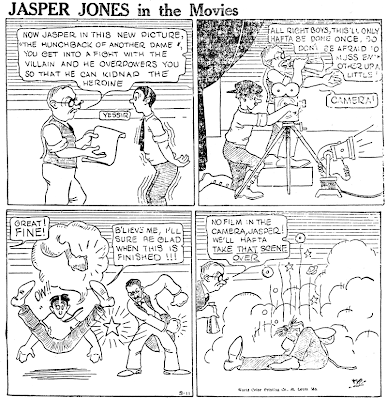 One exception to the rule, though, was Jasper Jones in the Movies. Not that it was new material, mind you. No, there almost seemed to be a rule against that. But it was quite a bit newer than most of the fare, like Luke McGlook strips from 1915. You may wonder why I'm approaching Jasper Jones from the wrong end, so to speak. Why discuss the reprint run? Well, it's because I have never seen the strip in its original run. 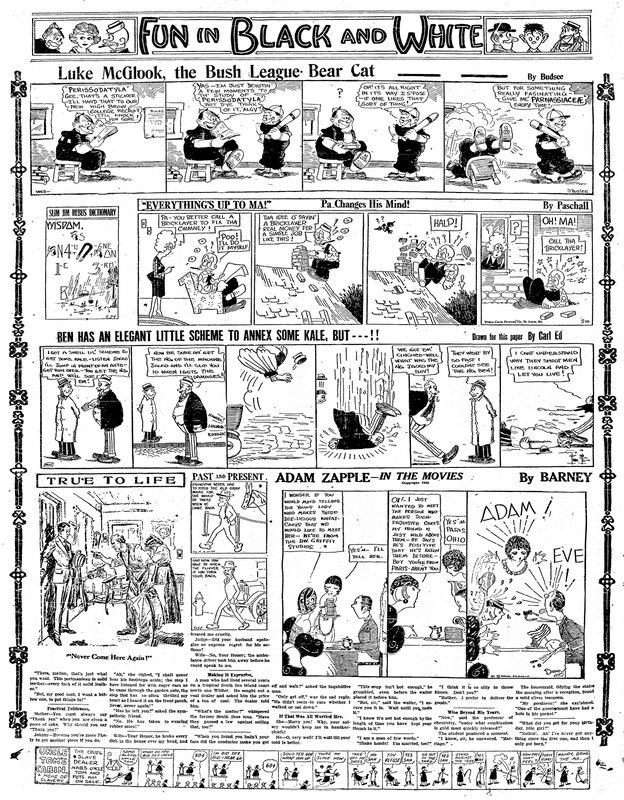 What I can tell you is that when World Color Printing began running the strip in 1924, the first episodes were titled Adam Zapple in the Movies, and they were oddly-shaped affairs, usually two quite large panels in a 3- or 4-column arrangement. Examining these strips minutely, I am able to pick out a syndicate stamp on a few that seems to say something like "Morton Studios" or "Norton Studios", and the copyrights of these strips are in 1922 and 1923. Therefore they apparently ran somewhere as much as two years earlier through a different syndicate, one I've never heard of. Even later, after the name of the strip changed, there are telltale signs that they come from an earlier run, one that was most likely daily. You can see in some of the samples above the lettered-in day of the week, and even dates (or maybe they are codes) on some. The syndicate stamp is for World Color Printing now, but that could have easily been added later. Oh, one other detail. Who created this classic of western literature? 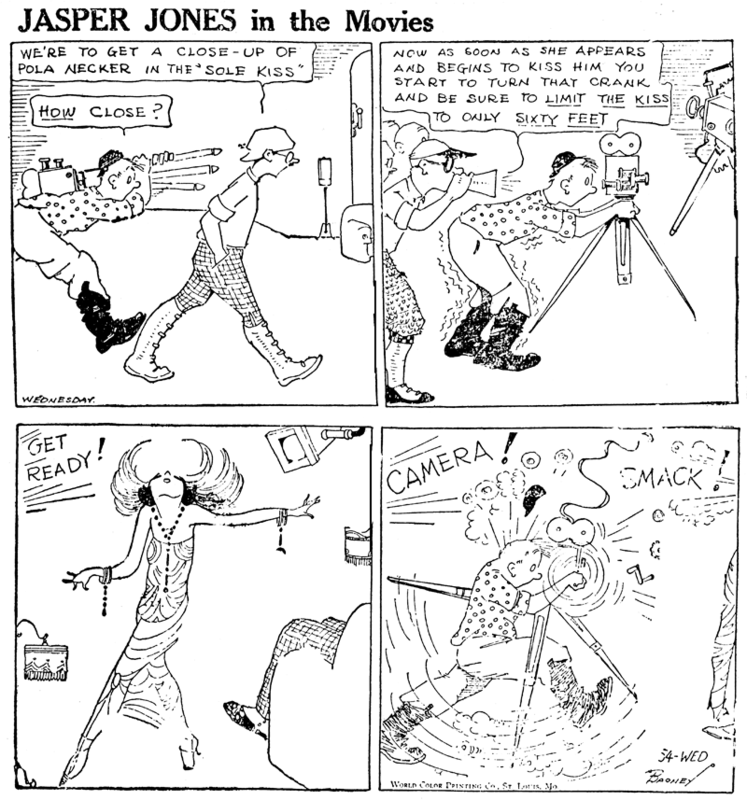 The earliest strips are signed by G. Barney. Later on the G. is dropped, and a new creator, 'Herb', pops up. For the bulk of the run, strips signed by Barney and Herb appear at random. No matter which signature appears, the art is Lockwood Correspondence School drop-out quality. 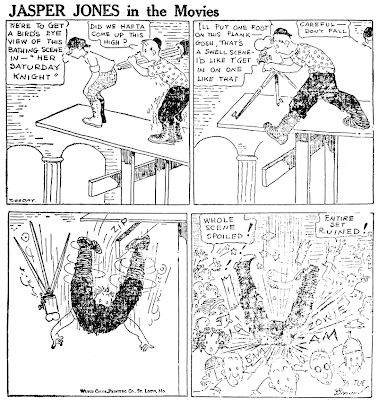 The strip ran on the weekly World Color Printing page from 1924 to at least 1933, and if you wonder why the printing quality of the samples is so awful, believe me, I looked through a big stack of those World Color pages looking for these ones, in which the printing is even somewhat legible. World Color Printing must have been shipping out really low quality plates to these papers, because you very rarely see one of these pages that isn't a type lice lovenest. If anyone knows anything about the original pre-World Color Print run of this strip, I'd very much like to hear from you ... and it looks like Alex Jay seems to have something up his sleeve for us tomorrow in that vein. I can't wait! Vance Rodewalt's editorial cartoons are a long-time Calgary, Alberta fixture, and he's still going strong on the Calgary Herald. 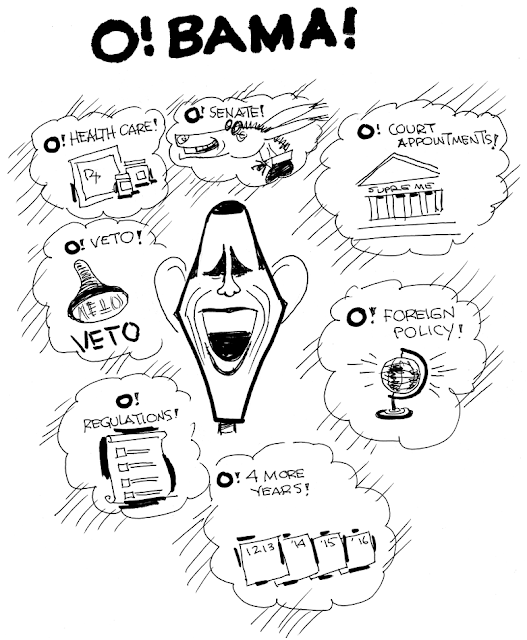 But like many of his editooning brethren, he tried his hand at a comic strip. In 1988, Chubb and Chauncey, a strip about a pair of dogs, debuted in U.S. syndication through Tribune Media Services. The idea of the strip was that one dog, Chubb, was a lower-class pooch, while the other, Chauncey, fancied himself some sort of royalty. However, I seldom see that angle being played up in the strips I have. It looks more like Chubb was Rodewalt's preferred character and ended up getting 90% of the spotlight, along with the dog's owners, a pleasant enough middle class family. The series apparently started as a daily only on September 12 1988, and the Sunday was added in 1989. In 1990, a dispute with the syndicate caused Rodewalt to pull it, and move syndication to the Toronto Star Syndicate, losing all his U.S. newspaper clients in the process, but making the strip available in Canada, where his name recognition helped with sales. The strip was also placed with Editors Press Service, which sells to foreign markets, and, according to Rodewalt, they were able to place the strip in a goodly number of papers worldwide. Rodewalt seems to have retired the strip sometime in 1998. I'm finally up to indexing 1988 in my New York Sunday News project. Chub and Chauncy debuted as a Sunday feature in the Daily News Sunday comics on October 2, 1988. I'll track it there as long as it lasts and report back here shortly. Thank you Michael! When you're done indexing that trove, are you going to publish somewhere? There's a lot of data I'd love to see from the NY Sunday News run of yours! If the name Hop Harrigan sounds familiar, it's probably not because of this comic strip. The character debuted in comic books, All-American Comics #1 to be specific, and was a popular feature of that comic book series from 1939 to 1948. Hop Harrigan was also a popular radio show series and a movie serial. He even had a fan club that boasted a long membership list of American flying-crazy kids. It seemed like Hop Harrigan was able to conquer any medium except for newspaper comics. The newspaper series began on May 11 1942, penned by the same creator, Jon L. Blummer, who did his adventures in comic books, and distributed by the George Matthew Adams Service. It was cancelled just a little more than a half year later. The latest found to run it so far is the Brooklyn Eagle, which ended it on December 31 1942 (a Thursday). I think perhaps the problem lay in the strip's resemblance to Tailspin Tommy, which had just expired a few months earlier after a long run. Perhaps its cancellation was proof to editors that the interest in flying had leveled off among their readers. It was the start of America's involvement in World War II, also, and domestic flying adventures, even if the occasional German saboteur was thrown in, probably seemed a little tame. Samuel Carlisle Martin was born in St. Louis, Missouri on November 13, 1867, according to a family tree at Ancestry.com. His middle name was his mother’s maiden name. In the 1870 United States Federal Census, he was the third of four sons born to John and Hattie; apparently he was born shortly after his twin brother John. His father was a railroad ticket agent. The family lived in St. Louis. The 1880 census recorded the Martin household of seven in St. Louis at 2608 Gamble Street. Martin attended the School of Fine Arts at Washington University in St. Louis; his name was found in the Catalogue of the Officers and Students of Washington University for the academic years 1885–86 and 1887–88, which also listed his brother, John. The family tree said Martin married Lynn Shackleford on October 30, 1897. The 1900 census recorded Martin, his wife (listed as Lena), and brother John in St. Louis at 3848 Page Avenue. Both Martins were newspaper illustrators. They contributed to the book, St. Louisans “as we see ’em”: Cartoons and Caricatures (1903). Martin participated in two 1902 newspaper artists exhibitions as reported in the St. Louis Republic on March 29 and October 19. He contributed a caricature to the magazine, Book of the Royal Blue, May 1904. The Cleveland Plain Dealer, May 11, 1909, published quotes by Ty Cobb, who was interviewed by Martin, a St. Louis Post-Dispatch cartoonist and baseball writer. The Martin household included a son and daughter in the 1910 census. They lived in St. Louis at 5188 Morgan Street. In this year, Martin started drawing the Weather Bird cartoon for the Post-Dispatch. He did the Sunday feature in 1912 from around March to late December. The family of four resided at 511 South Geyer in St. Louis, as recorded in the 1920 census. Martin continued as a newspaper artist. The Kansas City Star (Missouri), October 12, 1922, printed his drawing. The “Donkey” Is No More. Jefferson City, Oct. 12.—Thomas H. Fisher of Marshall, secretary of the Democratic state central committee, has filed with the secretary of state an engraving of the “Goddess of Liberty [a dead ringer for the Statue of Liberty],” which will replace the donkey as the official emblem of the Democratic party in Missouri. The design will appear on the ballot above the name of the Democratic party in the November election. The new blanket ballot law authorizes political parties to adopt party emblems. The drawing for the emblem was made by S. Carlisle Martin, a St. Louis artist. In the 1930 census, the household of three was at 6117 Washington Place in St. Louis; their son, Samuel Jr. had moved out. Martin passed away August 17, 1932, in St. Louis. His death was noted the same day in the Monitor-Index and Democrat (Moberly, Missouri). St. Louis, Aug. 17 (AP)—Samuel Carlisle Martin, head of the art department of the Post-Dispatch and who for twenty years has drawn the “Weather Bird” cartoon which appears daily on the front page of the newspaper, died of heart disease at his home here today. He was 64 years old. Amadee Wohlschlaeger took over as Weather Bird artist; he celebrated his 100th birthday December 3, 2011.